English post-punk act Gang of Four will release a new EP, Complicit, on April 13. This is the first new material from the group since the critically acclaimed 2015 album, What Happens Next. 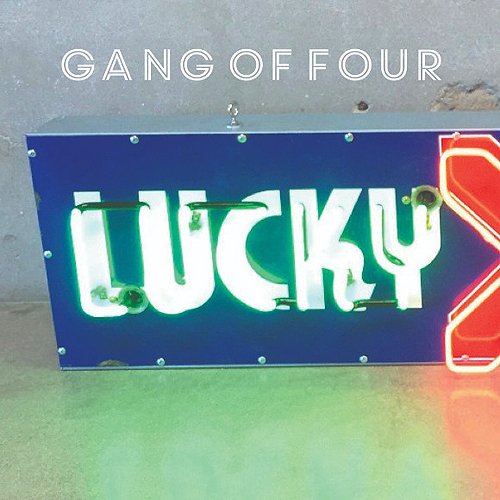 The band has released “Lucky” as a streaming single to tide fans over until the full release. The track was jointly written by founding member and producer Andy Gill with front man John “Gaoler” Sterry, with production by Ben Hillier (Blur, Depeche Mode). Described as “a product of chance,” Gill comments about the song, “I’d been watching a serious debate on one of those financial news channels – six white men in suits arguing about the stock markets – and it set me thinking about how limited luck can be. America’s demented ringmaster-clown claims to have bestowed fortune on the markets. He believes himself the master of luck. In reality, they are casinos. A lot of trading is anyway now done by algorithms to try to eliminate the element of chance, but luck isn’t capable of fundamentally changing the system. Even if you believe market crashes are the result of bad luck rather than layer upon layer of human and machine error, the system shudders, restarts, and goes on as before.” Despite the serious subject matter that inspired it, “Lucky” manages to be irresistibly danceable thanks to an infectious groove courtesy of Thomas McNiece on bass and Tobias Humble on drums.